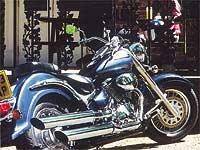 SUZUKI’S 2001 VL800 Intruder Volusia has finally reached UK showrooms. Named after a biker gathering place in Florida, the Volusia is a traditional, Harley-style cruiser using the well-proven, decade-old 805cc air-cooled V-twin from the VS800 Intruder. Available in black/white or blue, the Volusia can be yours for £5349 on the road. The price includes twelve months AA cover and Alphadot security marking.